My tomato plants are all getting tomatoes on them now. But this morning, I was disappointed to find spots on two tomatoes on one of the clusters of my Celebrity tomato plant. What is this and what causes it? 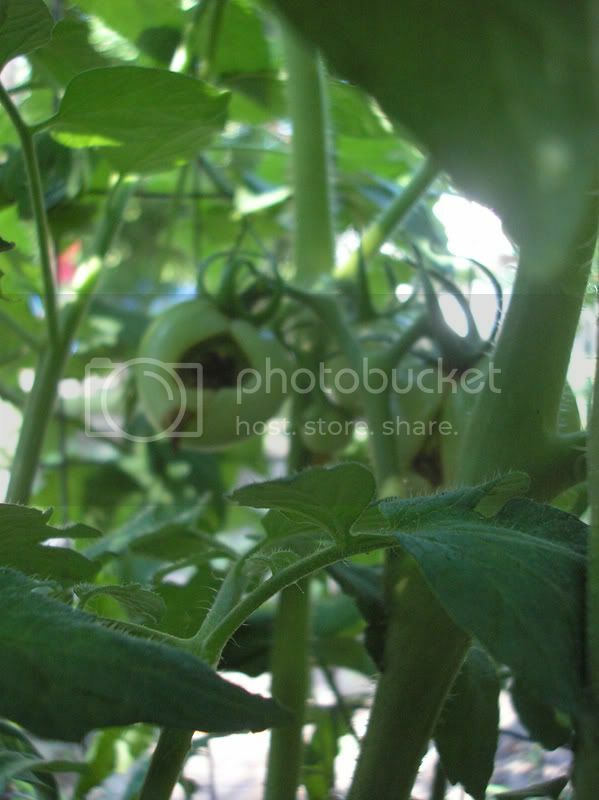 And more importantly, how do I make it stop> should I snip these two tomatoes off of the plant now before anymore damage occurs? The tomato with the largest spot is about the size of a walnut. the spot does not appear to go through the skin of the tomato but it doesn't look right. Is this blossom end rot? I see no other spots on any of the other varieties I have in the garden. We have had ALOT of rain this spring in the midwest. I have not had to water the garden at all. In fact, I think it's too wet. Your picture makes me think of tomatote hornworm. Open up the affected tomatoes to see if there is anything inside. If you do find a worm, basil repels the hornworm. I cut open both affected tomatoes and there is no worm inside. The blemish was only as deep as the tomato skin is deep, maybe slightly more. I took some photos of them after I cut them open, if anyone would like to see what the inside looks like. OMG!! I just goggled horn worms! Major ick factor! It seems that wasps lay their eggs on horn worms and the body of the worm gets covered with the wasp larvae. I think if I ever ran across that in my garden, I would pass out! I'm squimish like that. Oh ICK! YUCK! CHOKE! This city girl has an aversion to wormy things covered in larvae! I am pretty sure it is blossom end rot. Can it be Blossom End Rot even if it isn't on the end of the tomato though? The watering issue could be causing it I guess. We have had so much rain and so many storms. So far, these are the only two tomatoes that I can see have this problem. Where do I buy bonemeal or dolamite? I don't think I eat enough eggs to do any good. I do use coffee grounds around my tomato plants. Could this cause a problem? Tomatoes get different kinds of black spots. Blossom End Rot (BER) is the black spot is on the bottom of the tomato where the blossom had originally been it will grow in size, somewhat sunken in appearance and leaves soft tissue that often is infected by fungal spores, often resulting of total loss of that particular fruit. Blossom End Rot is caused by a lack of calcium. Calcium is present in most soils in adequate amounts. The problem is that the plant cannot absorb enough calcium through its roots because of dry soil conditions. That's because calcium is taken up by the roots along with water. If, for some reason, water uptake is restricted, calcium uptake will stop. Since you've got plenty of water, your problem is not likely to be BER. Besides, the black spots are not on the end of the fruit. This can be caused by anything that damages the fruit at the beginning of its development. Cold (below 50 F), cloudy, and wet weather or poor pollination at blooming time are the primary cause. In some cases, erratic soil moisture and tempreture can cause to catfacing. High nitrogen and excessive pruning have also be shown to aggravate this disorder. Large-fruited cultivars are more susceptible to catfacing. To minimize catfacing: Maintain even moisture levels, do not use glorious nitrogen fertilizers (especially during fruit set), avoid excess pruning, & select cultivars that are not prone to catfacing. I think that must be what it is.....catfacing. Our weather here has been very wet and cloudy with a few days of sunshine thrown in every now and again. I will keep an eye on the other tomatoes that have set on and see if they have the same problem. Hopefully, this is an isolated case. Thank you so much Nan, that was very informative! Daphne wrote: I think that must be what it is.....catfacing. Our weather here has been very wet and cloudy with a few days of sunshine thrown in every now and again. Daphne.. i know this is a late answer. And ya already know it's not a serious problem. But, in case ya run into it again... I'm gonna say that it was incomplete pollination. And from the timing of your original post, I'm gonna guess the reason you had incomplete pollination was cause of the cold weather. I'm sure you don't have that problem now.. but just in case you start wondering bout it next spring. And ya.. you can just pick em off if you see em... they won't get more pollinated or fill out any more by leaving em. HELP PLEASE! SPOTS ON TOMATOES! blossom end rot for sure.. I had it all summer. It looks like blossom end rot which can be caused by too much H2O or lack of calcium, what I have done to cure this is use Tums crushed on top of soil, works great. Lime in the soil would be a cheaper way to avoid blossom end rot.